This week I have a slightly different way of reporting a post. This post includes a Spoiler Warning. 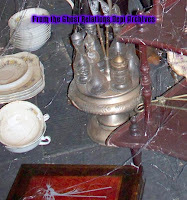 At the Walt Disney World Haunted Mansion, the Imagineers/Property Asset Managers/Set Decorators (or whomever it may have been), has installed a few references to Jack Skellington and the Tim Burton story, The Nightmare Before Christmas. While I am certain that the ones pictured below aren't the only ones in the mansion, they are a few of them. So if you want to go on your very own Jack Skellington scavenger hunt, then read no further. 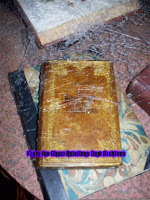 The following Spoiler contains both descriptions and photos of where they are found. NOTE: All photos in my blog can be clicked on for a larger version. I am making these small as to not spoil it for people passing by to other posts. One of the first encounters with a Jack reference is in the Library. 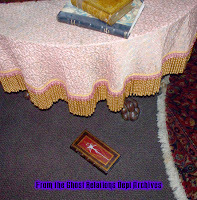 Below the table with the lamp there is a red book on the floor with a white drawing of Jack on the cover. Also in the library on the same table is a copy of The Nightmare Before Christmas. In the attic there is a tiered shelf that contains two champagne flutes and a set of porceline figures (one with the head broken off of course). On the floor to the left of this shelf is another book, similar to the one in the library but with a different drawing of Jack. Also in the attic is a Jack Snowglobe on a shelf, and where the old bride once stood is a Jack plushie. These are the ones that have been found so far, but try your hand at finding more! Heh. They just can't resist giving a couple of cranks to the WDW HMH rumor mill machine, can they? A very nice tribute. I haven't seen the Florida Mansion since it reopened, but I suspect the changes will make it my favorite Mansion/Manor. That's fabulous! I wonder if we'll see these items in our own mansion in Anaheim after the holidays? Along with the new refurbs that attacked WDW this fall? Mmmmm... we can dream! great find, GRD!! Thanks for sharing!